You know a writer’s getting desperate when he reviews his own book. Such was my situation a few years ago. No one else would do it at the time, so I had to. 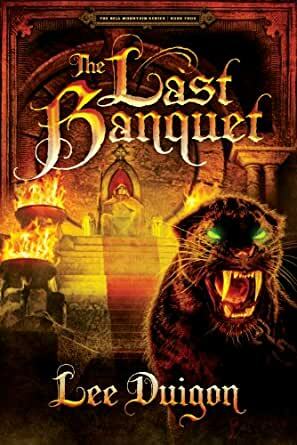 Oddly enough, The Last Banquet seems to be the book most tapped by readers as their favorite in the Bell Mountain series. Well, I was rather clever with the ending, wasn’t I? Sorry, there I go again. This entry was posted on Tuesday, February 12th, 2019 at 10:24 am	and tagged with a message to my readers, bell mountain series by lee duigon, The Art of Writing, the last banquet and posted in Book Reviews, Fantasy Criticism, Reviews of My Books. You can follow any responses to this entry through the RSS 2.0 feed. It’s definitely my favorite one in the series. The ending was mind-blowing! Hey, Elijah, who’s your favorite Bell Mountain character? Gallgoid, beyond a doubt! I think he’s really cool. I think he is too! Great choice! Well, maybe I should clarify. I like the new Gallgoid, not the one who poisoned people because he was told to. It’s very good that Gallgoid turned to God for forgiveness! To be honest, I kind of like the bad guys in the series, especially Lord Reesh. You like him in what sense? I mean, I like him in the sense that I think Mr. Duigon did a great job creating him, but I was glad when he died. Lord Reesh was a real character to me, and I enjoyed writing about him–so, yeah, I liked him, too. I was sorry to have to kill him off, but the story demanded it. You can’t say he didn’t deserve it. Do you know when The Temptation is going to come out? No, I don’t. There was a small problem with the cover. But it should be soon. Do you have any say about what the cover looks like, or is it all up to the publisher? The cover artist reads the book and then he and I confer on possible cover ideas. We work together at it. Same guy–but has received God’s grace. He’s more himself now than he was before. That’s one of the things God’s grace does. Who is your favorite character Joshua? Sorry, that was a joke. Hmm, that’s a hard question. I really like all of them, but I think my favorite character is, are you ready?… (drums rolling)… Helki the Rod! Rod flying all over the place, enemies crumpling down to the ground, Helki the Rod himself standing on top of the mound of fallen villains. Nothing can stand in his way. He is Helki the Rod. Cool! What?! You don’t like Hesket the Tinker?! Just kidding! Yes, the “giant killer” is pretty cool! He’s a great leader, and the best forester in Lintum Forest. Three cheers for The Flail of the Lord!